F TROOP: THE COMPLETE SECOND SEASON (1966-67 WB/ABC-TV) Starring Forrest Tucker (Sgt. O'Rourke), Larry Storch (Agarn), Ken Berry (Captain Parmenter), Melody Patterson (Wrangler Jane), Frank de Kova (Wild Eagle), James Hampton (Dobbs), Don Diamond (Crazy Cat), Bob Steele (Duffy). Directed by Seymour Robbie, Hollingsworth Morse, Gene Nelson, Hal March. Produced by Herm Saunders. Executive Producer Hy Averback. New day. New time. New executive producer and producer. Several new writers and directors. Switch from black and white to color, from descriptive theme song to instrumental, from live action opening to caricatures by MAD magazine’s Mort Drucker. 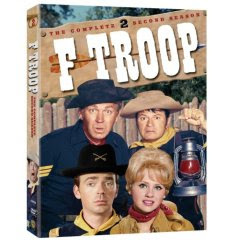 It was a startling number of changes in store for F TROOP’s second season, and unfortunately, there were more losses than gains in the opinion of this reviewer. In a reverse of today’s corporate mantra, the show went from great to good. Perhaps a sophomore slump of sorts was inevitable given the quality of the classic first season. Even so, while Season Two still contains a number of terrific episodes, there’s also a lot of evidence suggesting way too much network tinkering. ABC switched F TROOP from a Tuesday night slot opposite CBS’ long time killer THE RED SKELTON SHOW (F TROOP had been the first ABC show to survive against Skelton at 9 P.M. Tuesday in 8 seasons) to what seemed like a cushy Thursday night slot following BATMAN. But unfortunately the changes didn't stop there. Gone from the stellar first season were Executive Producer William T. Orr, the show's best director, Charles Rondeau, and perhaps most damaging of all, ace writers and co-creators Ed James and Seaman Jacobs. In addition, the show’s second best writing team, Stan Dreben and Howard Merrill, was reduced to a mere cameo (only two episodes), as was series co-creator Jim Barnett (one). Arthur Julian’s workload went up, to a whopping 16 of the 31 second season shows, and he was predictably tapped out, delivering several of the clunkers. With F TROOP’s new early time slot (8 PM ET) and new creative team the focus was often taken off the schemes and scams of O’Rourke and Agarn, and the slapstick was played up to appeal to the kiddies. With this younger audience obviously in mind, the edgy (for 1960’s TV) characters who were either clueless or heartless (in Agarn’s case, both) changed as well, becoming much more conventional. The result really softened what had been a subtly subversive show. Too often during Season Two, F TROOP actually became what its detractors claimed it was: a poor man’s PHIL SILVERS SHOW. Formerly self-serving Sgt. O’Rourke continued to scheme, but acquired a Bilkoesque heart of gold. Whereas before he would pull every string he could to keep a moneymaking business going, here he’s giving up scam after scam to assist elderly widows, young lovers, children…even a wild horse in one instance(!). He’s also thinking of profits less and less as the season progresses. Corporal Agarn, formerly dim but sufficiently devious and greedy to assist O’Rourke ably, became much dumber, crying at the drop of a hat and basically making you wonder just exactly what he contributed to O’Rourke Enterprises. Captain Parmenter, clueless and completely hopeless in Season One, gained all the intelligence Agarn lost and then some. This season, he’s still clumsy, but has become a gallant and even competent leader, leading everyone out of the wilderness on a survival test and legitimately passing a test for promotion to Major, two things that would have been unthinkable a season before. Equally damaging, the give and take between the Hekawis and O’Rourke Enterprises becomes very one-sided, with Wild Eagle getting the best of the deal again and again. A lot of the entertainment from Season One was watching O’Rourke and Wild Eagle barter; in Season Two, the negotiations were so one-sided I figured Wild Eagle would get Manhattan Island back for 24 dollars next. The guest stars in Season Two are arguably even better than the lineup in Season One, and the color film does look gorgeous. The actors are still in great form, their terrific chemistry triumphing over ill-advised changes in their characters (Storch even garnered an Emmy nomination for this season). And while there aren’t many home runs like THE 86 PROOF SPRING, THE DAY THE INDIANS WON and HERE COMES THE TRIBE, there are a number of doubles and triples. A few of the new writers bring some vibrancy; Austin and Irma Kalish in particular contribute some very impressive episodes outside the usual F TROOP formula. One positive change is the use of both a teaser AND a tag, rare in sitcomland. We also get some of the funniest pre-POLICE SQUAD! freeze frames ever. And one great new running gag: Agarn's "Who says I'm dumb?" which was exclusive to this season. Season One had a fantastic 20 episode run in the final two-thirds. Season Two really slumped in the middle third, but it is a shame that F TROOP didn’t get a chance at a third season, for the final two episodes are arguably the best two episodes of the season: OUR BRAVE IN F TROOP, a terrific episode that refocuses on O’Rourke Enterprises, and IS THIS FORT REALLY NECESSARY?, one of the very best of the entries to step outside F TROOP’s usual formula, with more plot than the average straight western, but still funny. While we'll never know if the ship would have been fully righted in a third season, these final two episodes suggest that it was very possible to do so. THE SINGING MOUNTIE **** Guest star Paul Lynde plays the title character, who is pursuing Agarn’s cousin, suspected fur thief Lucky Pierre (gotta love this slipping past the censors of the day). Great opener marred only by Agarn’s disappearance halfway through; very inspired laughs. Arthur Julian’s best script of the season by far. HOW TO BE F TROOP WITHOUT REALLY TRYING ½* F Troop is assigned to split up and leave Fort Courage. A real dud in every regard, with very lame jokes and a shockingly ineffective O’Rourke resigned to his fate instead of fighting the orders the way he had in THE NEW I.G. and A FORT’S BEST FRIEND IS NOT A MOTHER among others. BYE BYE BALLOON *** Considered by many to be the most famous episode (“It is…balloon!”). Harvey Korman is in top form as a visiting Prussian general; of course, it’s really F TROOP tweaking the Nazis a la HOGAN’S HEROES. O’Rourke and Agarn again don’t seem to be protecting their business interests as much as they should, and there are some gaps in logic, but there's still a lot of side-splitting funny business from Storch and Korman here. REACH FOR THE SKY, PARDNER ***1/2 Charles Lane, the man of a thousand foreclosures, guest stars as the local banker eye-balling O’Rourke’s saloon after a series of mail robberies puts him in jeopardy of missing his mortgage payments. THE GREAT TROOP ROBBERY ***1/2 Milton Berle as Wise Owl, in a sublimely silly story about Agarn’s amnesia coinciding with a rash of robberies. Who’s the culprit? Well, sometimes not wise to be wise—more wise to be unwise! THE WEST GOES GHOST **1/2 O’Rourke Enterprises takes in two new partners, as Dobbs and Vandy join O’Rourke and Agarn in resigning from the army to homestead a ghost town….rumored to have real ghosts! Would have been more effective in black and white IMO. YELLOW BIRD ***1/2 Dreben and Merrill wrote this one, an inspired F TROOP version of THE SEARCHERS, with O’Rourke seeking to rescue Julie Newmar from Indians because her father is the richest man in Texas. Newmar looks great as always and has a real flair for the show’s physical humor. One quibble: O’Rourke comes across as really, really stupid in his business dealing with Wild Eagle here. THE BALLOT OF CORPORAL AGARN *** Some gentle ribbing of Ronald Reagan’s entry into politics (the song and dance man is even named Bragan) in this episode giving Agarn the deciding vote in his hometown’s mayoral election. An extremely far-fetched resolution, but still a funny episode overall. DID YOUR FATHER COME FROM IRELAND? *** Forrest Tucker gets his turn at a dual role, playing Angus O’Rourke, the sergeant’s very Irish father. Some priceless give and take between “Mr. O’Rourke” and Agarn. FOR WHOM THE BUGLE TOLLS **1/2 Richard X. Slattery is the latest threat to O’Rourke Enterprises, an officer who typically judges an entire fort by the quality of its bugler. MISS PARMENTER **1/2 The captain’s equally clumsy sister visits, and takes a liking to Bugler Dobbs while assisting in a critical operation for Wild Eagle. Don Diamond gets some of his funniest moments as the still selfish, borderline heartless Crazy Cat. LA DOLCE COURAGE ***1/2 An inspired script by Austin and Irma Kalish finds O’Rourke putting a traveling Italian cook to work in his new banquet room at the saloon. Unfortunately the man’s beautiful daughter (Leticia Roman!) is being stalked by The Black Foot. Four….NO….minestrone……. 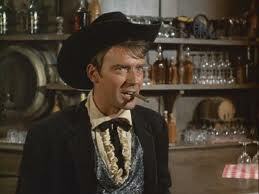 WILTON THE KID * Ken Berry’s turn at a dual role. Unfortunately this script just isn’t very funny. THE RETURN OF WRONGO STARR ***1/2 F TROOP’s most popular guest character returns in series co-creator Jim Barnett’s only writing credit of the second season (co-written with Merrill and Drebin). Some great lines throughout, and Henry Gibson is always a welcome presence. SURVIVAL OF THE FITTEST *1/2 Agarn and Parmenter go on a survival test. Arthur Julian, who wrote this and 28 other F TROOP episodes, has a funny cameo as Fort Courage’s new undertaker. BRING ON THE DANCING GIRLS **1/2 A re-working of O’ROURKE VS. O’REILLY, with O’Rourke facing a male blackmailer this time. Should have been great, but it’s a little hard to swallow Agarn being this weak a link in the O’Rourke Enterprises chain after what’s been established before. THE LOCO BROTHERS **1/2 Captain Parmenter is kidnapped by renegades. A reworking of THE RETURN OF BALD EAGLE, but quite a bit better than that rare first season dud. FROM KARATE WITH LOVE *** O’Rourke goes into the Japanese souvenir business, not knowing that the girl F Troop is providing sanctuary for is being pursued by a vicious Samurai (Mako). THE SERGEANT AND THE KID *** 10 year old Joey Walker joins the troop, and turns out to be Fort Courage’s best soldier. Go figure. One of the better experiments, giving O’Rourke a romantic interest (Pippa Scott), the boy’s mother. WHAT ARE YOU DOING AFTER THE MASSACRE? 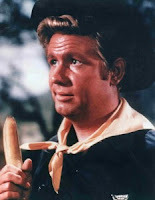 **1/2 One of the more famous F TROOP episodes features Phil Harris (Forrest Tucker’s boyhood hero) as 147-year old Flaming Arrow and a cameo from Mrs. Tucker herself, Marilyn Fisk. 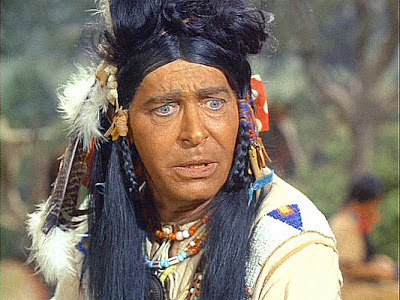 The deadpan Harris is screamingly funny, but after everything we’ve learned about the Hekawi tribe’s history, it’s just too big a stretch to see its oldest member as a brave, bloodthirsty warrior who doesn’t care about money. Not to mention Wild Eagle willingly giving up his profitable business to try and take the U.S. back. A HORSE OF ANOTHER COLOR * Bright moment early featuring O’Rourke’s latest invention, but otherwise a snore involving the inept efforts of O’Rourke, Agarn and Parmenter to capture the wild stallion, Black Devil. 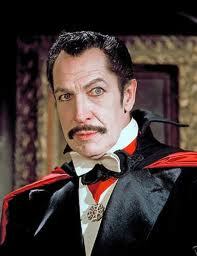 V IS FOR VAMPIRE *** As Wild Eagle puts it, “now that’s what I call a paleface!” Vincent Price plays Count Sforza, who may or may not be a vampire. Hey, what would the series be without one episode in a spooky old mansion? THAT’S SHOW BIZ (no stars) The authors of TV Land To Go had this listed as the best episode of the series. What were they smoking? Agarn quits the army to manage the Bedbugs, a musical group about a century ahead of its time. Clever idea but very poor execution: Agarn is giving them an unfavorable reaction in the teaser, then in the next scene is ready to resign to manage them. Almost none of the jokes are funny. THE DAY THEY SHOT AGARN ***1/2 Takes a page from WILL THE REAL CAPTAIN PLEASE TRY TO STAND UP?, telling the entire story in flashback. An inspired script and idea from the Kalishes, and look for the brief return of John Mitchum in a cameo (he was Private Hoffenmueller during the first season, another M.I.A. whose continued presence would have helped the color episodes). Great guest appearances here from Fred Clark and Victor French. ONLY ONE RUSSIAN IS COMING! ONLY ONE RUSSIAN IS COMING! **1/2 Larry Storch gets his third and final dual role. Okay, but not nearly as funny as his first two. GUNS, GUNS, WHO’S GOT THE GUNS? ** A recycled plot as a renegade is suspected of selling rifles to the Apaches. Compare this one to THE NEW I.G. from Season One to see how the mighty have fallen. Treason, whether real or implied, was cheerfully accepted as long as it was profitable in Season One! Here, why, it’s just unthinkable. Perfect example of how things went from subversive to conventional a little too often this season. MARRIAGE, FORT COURAGE STYLE (no stars) My pick for the very worst F TROOP episode ever. O’Rourke and Agarn’s second attempt at finding mail order brides is nowhere near as funny as the first (OLD IRONPANTS) and halfway through segueways into a third-rate reworking of THE COURTSHIP OF WRANGLER JANE. Well, actually…..the first season O’Rourke thought a married Parmenter would be good for O’Rourke Enterprises, and second season O’Rourke now tries desperately to save the captain from being “trapped” due to a nightmare Agarn had. It’s now people over profits, folks, and on this show it was much funnier the other way around. CARPETBAGGING, ANYONE? 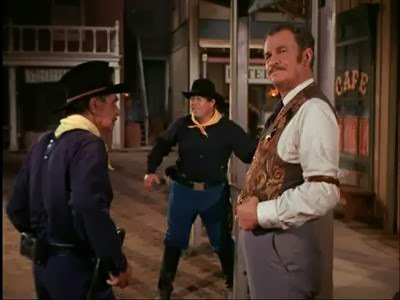 **1/2 James Gregory’s Major Duncan was also missing this season, but he makes an appearance as carpetbagging Big Jim Parker, who plans to take over the saloon, Wrangler Jane’s….and Fort Courage itself. The fort, not just the town! It’s sillier than usual throughout. THE MAJORITY OF WILTON (no stars) Absolutely nothing here is consistent with what preceded it, a running theme for the worst episodes of this season. O’Rourke doesn’t know the Army regulations? No thought at all to the impact a promotion would have on O’Rourke Enterprises? Skip it. The second worst F TROOP episode ever IMO. 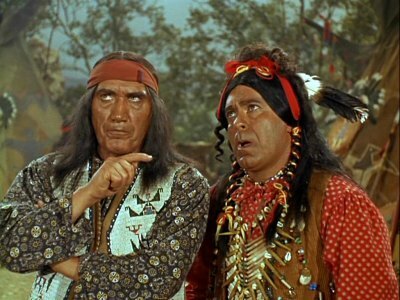 OUR BRAVE IN F TROOP **** The best color episode. Wild Eagle joins the Army to have his tooth pulled and ends up taking over the fort peacefully. A return to first season form in every respect, with Parmenter clueless, O'Rourke and Agarn pulling the wool over everyone's eyes, and a scheme getting way out of hand. Cliff Arquette steals the show as General Sam Courage, the Fort's namesake, who is even more senile than Duffy. IS THIS FORT REALLY NECESSARY? **** Several attempts were made to experiment with the F TROOP formula, and this was the most successful. Not only a funny script, but one with much more plot than your average dramatic western. Charles Drake and the former Mrs. Errol Flynn, Patrice Wymore (also seen in Season One’s SHE’S ONLY A BUILD IN A GIRDLED CAGE) guest star as an efficiency officer and his bride-to-be, who also happens to be a former flame of O’Rourke’s. At least there’s something extra this time around. FALL IN WITH F TROOP is a 28 minute retrospective featurette with sadly limited contributions from the major cast members. Ken Berry, writers Austin and Irma Kalish, and Phil Rawlins (producer/director) are among those interviewed on camera, but where’s Larry Storch? How about James Hampton or Melody Patterson? At least the third Mrs. Forrest Tucker, Marilyn Fisk, is interviewed on camera, and Joe Brooks is interviewed off-camera. It’s a fun featurette with some good behind the scenes info, but too little input from the folks who actually worked on the show. Also a commentary would have been great. Storch recently contributed commentaries to THE PHIL SILVERS SHOW DVD; so why not F TROOP? The 31 episodes are presented full frame, same as Season One. Unlike the Season One DVD, episodes are broken down into seperate chapters for teaser, opening theme, Act One, Act Two and the tag. Quite an improvement in presentation from Season One. The batting average is considerably lower than on Season One. Still, while F TROOP’s second season is ultimately a disappointment, there’s only two seasons to be had, and this is one of the great ensemble casts in TV history. You should definitely check out Season One first, though. 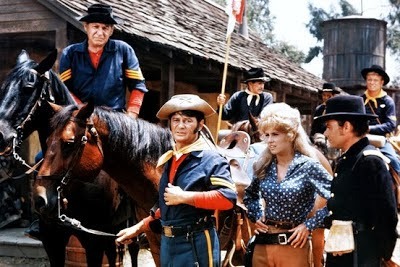 For the bargain shopper, the F TROOP TELEVISION FAVORITES DVD contains three of the best color episodes.